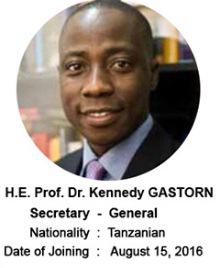 The Secretary-General in his “Report on the Work of the Asian-African Legal Consultative Organization” presented at the Forty-Ninth Annual Session, held in Dar es Salaam, United Republic of Tanzania (5-8 August 2010) had proposed the establishment of an “AALCO Eminent Persons Group (EPG)”. This proposal had been endorsed by the Member States, vide Resolution AALCO/RES/49/ORG 1, which was adopted on 8th August 2010. The EPG could serve as an informal guidance mechanism, “Advisory Body”, for the Secretary-General to steer the work of the Organization. The aim of this group should be to suggest to the Secretary-General the short, medium and long term measures needed for the substantive work and financial well being of the Organization. * How to explore ways and means to implement the aims and aspirations as set out in the AALCO Statutes, especially the “Putrajaya Declaration on Revitalizing and Strengthening of the Asian-African Legal Consultative Organization”. * Even though the principles adopted by the Leaders during the Bandung Conference guide the Member States, the present era offers great opportunities yet poses challenges for the developing world. Thus, this group could go into the relevance of the present substantive agenda of the Organization and suggest new areas of common concern. * Suggest appropriate ways and means to revitalize and strengthen AALCO as the main centre for harmonizing the actions of Asian-African States in international legal matters, thereby enabling it to contribute effectively to realize the functions and purposes of the Organization. * To act as the think tank for providing new ideas to the Secretary-General on strengthening existing Agreements and Memorandum of Understanding with international organizations and suggesting newer areas for cooperation. * Suggest ways to make AALCO’s presence stronger in the United Nations. * Suggestions on enlarging the Membership base of the Organization to include more states from Africa and Asia especially in Central Asia and the ASEAN countries. * To suggest concrete ways to alleviate the financial situation of the Organization. * The EPG may identify issues of common concern and formulate a strategy on how to proceed with the work on such issues.